My Faith Votes recently spoke with John Paine, author of The Luckiest Man: How a Seventeen-Year Battle with ALS Led Me to Intimacy with God. 18 years ago, Paine was diagnosed with ALS or Lou Gehrig’s disease, a degenerative neural disease that has progressively left him paralyzed from head to toe and will eventually take his life. ALS changed every facet of his life, causing daily challenges and physical suffering, but Paine has refused to be crushed in spirit or even to despair of life itself. 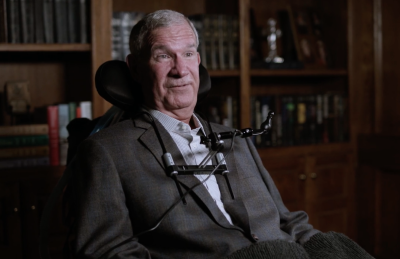 On the contrary, he credits his experience living with ALS as the cornerstone of a deeply intimate relationship with God. Take a few moments to watch the powerful interview.